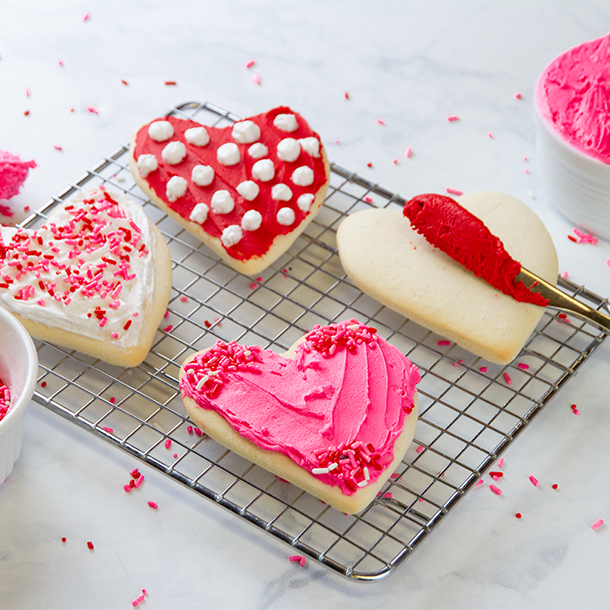 Bake your way into the heart of your loved ones with spreadable buttercream joy. Pick up some some sugar cookie dough and whip up this buttercream frosting for the perfect Valentines activity for you and the whole family! While the sugar cookie dough is still chilled, roll it out on a floured surface to 1/4 of an inch thickness and cut with into your favorite festive shapes. Bake according to the package instructions. While the cookies are baking, cream softened butter with a stand mixer or with a hand mixer until light and fluffy. Slowly ad the powdered sugar. Once the powdered sugar has been fully incorporated, add the vanilla and milk and whip until fluffy. Section the completed frosting into additional bowls and color as wanted. Once the cookies are cool, load up piping bags or plastic bags and start decorating! Happy Valentines Day!